Give your hair (and your ego) a beauty-full boost with our Full Bodied Volumizing Shampoo. This revolutionary formula not only cares for and repairs hair, but plumps skinny strands with a unique blend of proteins giving your hair gorgeously healthy, bouncy volume that defies gravity. It’s time to forget about back-combing, with our touch-to-style technology, you can tease hair into shape with a simple rustle of your fingers. Pea Peptides act as a film former to help build up and plump every strand for a gorgeous head of full and healthy looking hair. These hard-working proteins continue to work over time ensuring your hair never falls flat. Feather-light active micro-emulsion helps to protect and repair hair strands without adding unwanted weight or sacrificing volume. 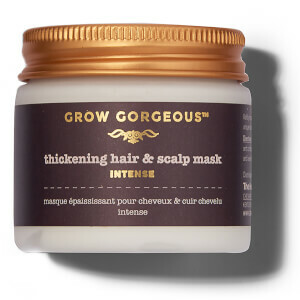 Ideal for thin hair that needs a little confidence-boosting ‘oomph’ and fuller, shinier looking hair. Thoroughly wet your hair and then apply a generous amount. Lather and massage from the scalp all the way through to the ends. 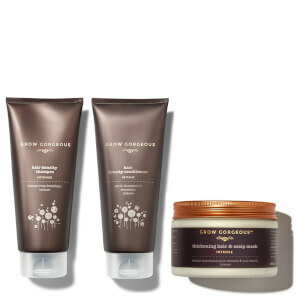 Rinse then follow with Grow Gorgeous Full Bodied Leave-In Conditioner for best results.